Baweka, translated from the Taino language as “Large Northern Basin,” was the name for the Caicos Bank at the time of Columbus. From Abawana (Grand Turk) to Makobisa (West Caicos) the islands supported a thriving native population on the eve of European conquest. Nestled between the Bahama Islands to the north and Hispaniola to the south, the Turks and Caicos occupied a strategic position in the northern West Indies. A position that resulted in a unique culture history. The Tainos had names for each island in the Turks and Caicos. Once called Arawaks for the family in which their language is classified, Native West Indian societies are today called Taino on the strength of cultural similarities. Geographical distinctions are made between Western (central Cuba and Jamaica), Eastern (Virgin Islands), Classic (eastern Cuba, Hispaniola, and Puerto Rico), and Lucayan (Bahamas) Tainos; and finer distinctions within these regions are now being defined. For example, at least three mutually unintelligible languages were spoken in Hispaniola at contact. Even after decades of research, the most difficult question for archaeologists to answer is: Who where the Tainos? Knowledge about the Taino occupants of the Turks and Caicos comes largely from the work of three archaeologists. The first was Theodoor DeBooy who visited all of the islands except West Caicos in the latter half of 1912 under sponsorship of the Heye Foundation and the Museum of the American Indian in New York City. DeBooy and collectors who came before him obtained exquisite examples of Taino art. But because these were rare in comparison to finds in the Greater Antilles, interest in the islands soon waned. This wooden statue of the Taino cemí (spirit) Opiyelguobirán, Guardian of the Dead, was collected from the Turks and Caicos in the early 1900s. Seventy-five years would pass before the next archaeologist, Dr. Shaun Sullivan, would come to the islands. Sullivan devoted two years to surveys and excavations in the Caicos Islands in an effort to track the Taino colonization of the Bahama archipelago (composed of the Turks and Caicos and Commonwealth of the Bahamas). He rediscovered forty Taino sites, all but five on Middle Caicos, and brought to light the unique characteristics of these sites. He also introduced Brian Riggs and myself to the Turks and Caicos. After working with Sullivan on Middle Caicos in 1978, I spent several years studying shell-tool making at the site on Pine Cay. After excavating site MC-12 on Middle Caicos with Sullivan, Glen Freimuth, and Brian Riggs in 1982, I initiated a series of archaeological surveys in the southern and central Bahamas to track the movement of the Tainos as well as the first voyage of Christopher Columbus. It was Columbus who brought me back in 1989 to a conference at which Robert Power and Josiah Marvel presented their case for Grand Turk as the first landfall of Columbus. During their conference I found two Taino sites on Grand Turk on either side of the Governor’s estate. Bob Power died of cancer before the Quincentenary, but he went to his grave believing that the last piece of the puzzle — Indians living on Grand Turk — had been found. Actually, what we have found since is, to me, far more interesting than Columbus’ first landfall. With the help of Mrs. Grethe Seim and Brian Riggs through the Turks and Caicos National Museum, and with funding from the National Geographic Society, we have begun to write the story that DeBooy and Sullivan first outlined. It is important to stress that Taino Culture developed in the Greater Antilles; it was NOT imported from any of the surrounding mainlands. The fabric of Taino Culture is woven from three main threads. 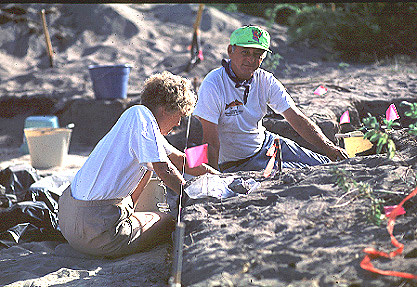 Betsy Carlson and Barbara Toomey screen soil from the GT-2 excavations, a site where shell beads were made. The first line is traced to people from the Yucatan Peninsula who entered Cuba around 5,000 B.C. Very little is known of these hunter-gatherers who fashioned long blades from local flints and who may have hunted sloths and manatees to extinction. 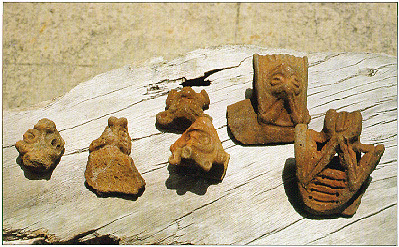 Sites containing the artifacts of these “Lithic” peoples occur in Cuba, Hispaniola, and Puerto Rico. About 2,500 B.C. people using ground-stone tools entered the Antilles, apparently from South America. There is presently no evidence of their migrations in the southern Lesser Antilles (Windward Islands). This absence may reflect a direct jump from South America to Puerto Rico or Hispaniola, rather than an island-by-island expansion. These “Archaic” peoples interacted with the Lithic peoples who were already adapted to the diverse environments of the Greater Antilles. The result was a variety of new cultures incorporating elements of flaked-stone, ground-stone, and shell technologies. Pottery was not used by any of these cultures, and they did not practice agriculture (although recent studies suggest that they may have husbanded useful plants). The main element of Taino society is traced through direct descent to the Orinoco River Valley of South America. From here the bearers of “Saladoid” pottery began to colonize the Antilles around 500 B.C. Previously it was assumed that they progressed from south to north one island at a time. However, recent radiocarbon dates indicate that Puerto Rico, the Virgin Islands, and some of the Leeward Islands were colonized first. We are again left wondering why the Windward Islands were by-passed. Saladoid peoples produced some of the most elegant pottery ever made in the Americas. The vessels were highly polished and decorated with white-on-red and polychrome painted designs, fine-line-incised crosshatch designs, and modeled animal and human heads and figures which adorned (hence “adorno”) rims and strap handles. Saladoid peoples practiced root-crop horticulture, cultivating manioc (cassava) and sweet potato as staples. They lived in small, roughly circular villages. Post hole patterns indicate that wind-screens were built on the sides of their houses giving them the shape of a sea turtle. They buried their dead beneath the central plaza to maintain close contact with the spirits of their ancestors. The Saladoid expansion stalled in Puerto Rico. For as yet unknown reasons nearly 1,000 years would pass before their descendants continued their expansion into the rest of the Greater Antilles and the Bahamas. These pottery adornos from Hispaniola represent the important Meillacan and Chican styles. Bonny Ericson collection, Providenciales. When the second wave of expansion began the pottery had devolved to mostly plain pots with simple modeled and incised decorations and red painting. This kind of pottery has been named “Ostionoid,” after a type site in western Puerto Rico, and it is the base from which all later styles developed. The most important of the later styles are “Meillacan,” which developed on the north coast of Haiti around A.D. 800 and spread westward into Cuba and Jamaica; “Chican,” which developed in south coastal Dominican Republic around A.D. 1200 and spread eastward to the Virgin Islands and westward to eastern Cuba; and shell-tempered “Palmetto Ware,” which developed in the Bahamas by A.D. 800 and which characterizes all of the pottery made within the archipelago. Recent radiocarbon dates indicate that Ostionoid peoples were living in the central Bahamas by A.D. 800. It is likely that they first entered the Bahamas by way of Great Inagua in the Windward Passage area. From Inagua the population spread north to Acklins Island and east to the Turks and Caicos. Early Archaeologist Theodoor de Booy noted sites on East Caicos, shown here as viewed from Flamingo Hill, but recent investigations have failed to identify them. Despite more than two decades of study, it is still not certain when, and from what direction, the Turks and Caicos were first settled. In fact, there appear to be three distinct population centers. There are 14 known archaeological sites from the western center which includes West Caicos (3), Providenciales (8), Pine Cay (1), Water Cay (1), and Parrot Cay (1). Radiocarbon dates are presently available for five sites in this group. The dates fall between A.D. 1170 and 1490. The earlier date is too late to reflect an initial colony, but it is possible that the as yet undated sites will yield earlier dates. The later date, from West Caicos, indicates that the island may have been occupied when survivors of the Molasses Reef wreck washed ashore. With the exception of Keegan’s study of shell tool manufacture at the Pine Cay site, we know little about sites in this group. Of special note is the Indian burials which are underwater in a cave on Providenciales. Middle Caicos, the central population center, has 36 known sites, which are described below. The four dated sites have dates which range from A.D. 1040 to 1437. The central and western groups are separated by North Caicos which apparently was uninhabited. DeBooy reported a cave site near Sandy Point, and open-air sites near Bottle Creek, but none of these sites have been identified during recent surveys. Moreover, because DeBooy’s phantom sites are adjacent to the western and central groups, there still appears to be a buffer zone between these groups. As the radiocarbon dates indicate, at least some settlements in each group were occupied at the same time. The eastern group is composed the Turks Islands and South Caicos. Once assumed to be uninhabitable due to their extremely dry climates, a total of 11 archaeological sites have now been identified on South Caicos (3), Cotton Cay (2), Salt Cay (2), Long Cay (1), and Grand Turk (3). 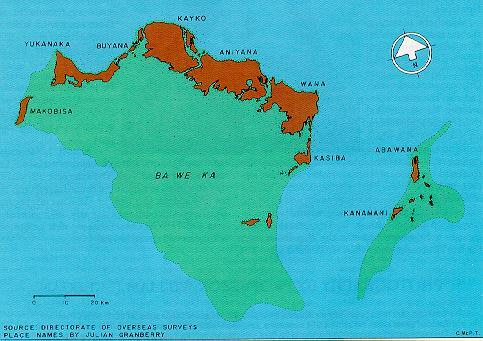 The eastern and central groups are separated by East Caicos, which also shows no evidence for aboriginal settlement. DeBooy again noted sites on the island, notably in the area of sisal production near Flamingo Hill, but recent investigations have failed to identify the site. East Caicos is today inhabited only by feral donkeys and cattle. The absence of roads, trails, and other clearings make the island extremely difficult to survey. It is possible that native peoples did live on both East and North Caicos, and that future surveys will identify their sites. We know more about the sites on Middle Caicos than we do about most other places in the Bahama archipelago because this was the center of Sullivan’s research in the late 1970s and early 1980s. Sullivan focused his efforts on the south coast near Armstrong Pond. Twelve sites were found here on the edge of the salina. Most were small scatters composed of a few potsherds, but three were sites of permanent habitation. This aerial photo of site MC-6 was taken in January 1978, when the site was cleared — it is today overgrown. The most interesting of which is site MC-6. Measuring 270-meter long by 70-meter wide the site has the remnants of semi-pit houses arranged around two plazas. Most other sites in the Bahama archipelago tend to be linear alignments of houses parallel to the beach. But MC-6, with its arrangement of houses around a central plaza replicates the community plan of Taino villages in Hispaniola. Of special note is the stone alignments that form a court in the center of Plaza I. When first discovered it was assumed that the rows of single stones were parallel. These edge markers, combined with the discovery of a stone at the center of the field, in which there was a ball-size depression, led Sullivan to propose that this was a ball court. A ball game, more akin to soccer than the Mesoamerican game, was played throughout the Classic Taino world as a means for divining the future and making important decisions. A Spaniard noted that his life hung in the balance over the outcome of a game played in Hispaniola shortly after contact. Dr. Shaun Sullivan proposed that the cleared area was a Taino ball court. When a detailed topographic map of the site was completed it was discovered that the rows of stones converged on either end of the east-west facing court resulting in an alignment with the rising and setting sun on the summer solstice. Sullivan also discovered a number of other alignments with the rising and setting of stars that are significant in Native American astronomical calendars. Of special note are alignments with the principal stars of the constellation Orion (e.g., Betelguese) which plays a major role in Taino and other South American myths. The three stars in Orion’s belt, it should be noted, lie in an almost exact line with the equator. Although rituals, games, and dances were likely played out on this court, the court also served as a direct link to the supernatural both as a calendar that recorded the passage of seasons and as an observatory that identified the location of important astrological events. Caribbean Research Foundation volunteers sweep loose sand from the still hard-packed 800 year old house floor near Bambarra, Middle Caicos. MC-6 has the only known ball court/observatory in the Bahama archipelago. 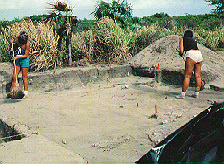 Combined with the large quantity of pottery and other materials imported from the Greater Antilles, the Classic Taino plan of the community, and the cacique‘s house at the end of the plaza, MC-6 is a unique and extremely important location for the study of Precolumbian cultural development in the northern West Indies. Moreover, the quality of the artifacts found on the two plazas varies in ways that reflect the hierarchical organization of Taino society. The Spanish reported that Taino society was composed of caciques of several levels (paramount, district, and local chiefs), members of elite families called Nitainos, commoners of no specific name, and a class of servants called Naborias. In addition to being the terminus of the road to Armstrong Pond and being built around the specialized court, Plaza I has far more exotic potsherds and jewelry than does Plaza II. A further distinction can be made between the north and south sides of Plaza I. There is a structure located at the end of the court at the conjunction of the two plazas. This structure has been interpreted as the Cacique’s house due to its larger size and two-chamber floor plan. Despite its central location, an embankment of materials physically connect the house to the south side of the plaza. Artifacts from the south side are superior to those on the north. The community plan and distribution of artifacts reflects the division of the community into elite and commoner lineages. In the summer, Armstrong Pond is ringed with a crust of crystalline salt. Sullivan concluded that MC-6, with an aboriginal road connecting the site to Armstrong Pond, along with the large number of other sites in the area, reflects an early trade between Middle Caicos and Hispaniola in solar-distilled salt. Crystalline salt, as Sullivan so clearly documented, is a crucial nutritional supplement in tropical agrarian diets. In the summer, the margins of Armstrong Pond become a crust of salt. To gain a sense of how much salt could be harvested, Sullivan’s had his 16-person crew collect salt for 15 minutes during the height of the dry season in July 1977. Their labors produced 120 gallons of salt, weighing more than half of a ton (542 kg). Earthwatch volunteers complete excavations at the Governor’s Beach site in Grand Turk (Betsy Carlson). In addition to the sites along the south coast salina, there are three large village sites on the north coast of Middle Caicos. During excavations in 1982 at site MC-12, near the beach at Bambarra, we excavated the floor of an 800 year old house. The pattern of dark stains and depressions in the floor matched that expected for an oval bohio of at least 10-meter length. Established around A.D. 1000, site MC-12 is the oldest radiocarbon dated site on the island. Two other sites, one near Conch Bar (MC-36) and the other about 2 km east of MC-12 (MC-32), have been radiocarbon dated to A.D. 1200, which is also the most recent date for MC-12. We are presently investigating whether population growth at MC-12 led to the fissioning of MC-12 with the establishment of MC-32 and MC-36 as daughter communities. Another possibility is that these sites were created by immigrants from other islands. Whichever the case, we are beginning to learn about Taino population dynamics in the northern West Indies. The eleven sites in this group are small and were established for special purposes. The three sites on South Caicos have not been excavated, but their extremely small size suggests that they were campsites or short-term habitations from which local resources were exploited. One site on Grand Turk is ephemeral and the one on Long Cay is but a single small potsherd tucked away in a mountain of empty conch shells. 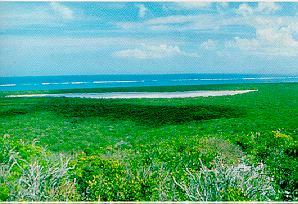 The sites on Cotton Cay and Salt Cay are more substantial, but they have not yet been excavated. 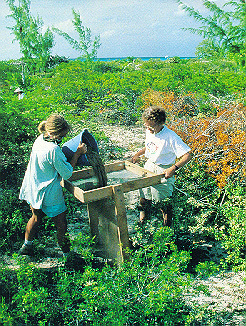 Earthwatch volunteers excavate a 1,000 year old fire pit at the Coralie site on Grand Turk. The remaining two Grand Turk sites are extremely interesting. The first, located on the edge of North Creek in a preserve established by Mr. Andrew Newlands on the property of Coralee Gardens, has a radiocarbon date of A.D. 900 making it the oldest dated site in the Turks and Caicos. All of the pottery in the site was brought to the island from the Greater Antilles (probably Hispaniola). We know this because the pottery contains quartz-sand temper, an ingredient which is absent from the limestone islands of the Turks and Caicos. The locally manufactured Palmetto ware has burned conch shell temper, and is completely absent from the site. In addition, the site contains substantial quantities of sea turtle and other animal bones which may indicate that the site was used for butchering animals whose meat was then exported to Hispaniola. Only limited testing has been completed at the site, but research planned for January 1995, with the assistance of EARTHWATCH and Earth Corps Volunteers will shed new light on the earliest residents of Grand Turk. GT-2 is a remarkable site. Discovered during the search for the villages reported by Columbus on the first landfall island, we now know that the site was occupied at least twice during the 12th and 13th centuries A.D. Throughout its history the site was a factory for the production of small disc-shaped beads. This string of 400 shell beads from the 1991 excavations at GT-2 are on display at the Turks and Caicos National Museum. In three years of excavations a total of 8,896 pieces of worked shell were recovered. Most of the worked shell is beads manufactured from the red Jewel Box (Chama sarda) and queen conch shells. A total of 1,495 complete beads, 4,147 broken beads, and 431 bead blanks have been recovered. In addition, olive shell pendants, large discs cut from trumpet shells, cut conch shell, mother-of-pearl from top shell (whelks) and oyster shell, and a brain coral cemí were also recovered. Most of which were unfinished or broken artifacts. The shell was cut with chert imported from the Greater Antilles. A total of 567 chert pieces, including 52 wasted drill bits, five cores, and 393 flakes were recovered during the 1992 and 1993 excavations. The drills display either a three or four sided pyramid in cross-section, and the average drill is 7.5 mm long and 3.5 mm thick. Other imported stone includes cylindrical diorite beads, calcite pebbles (of no apparent use), an elongate quartz pecking stone, a flake of jadeite, and a rock containing pyroxene crystals. A limestone anvil and concrete polishing stations were used to process Chama into beads. Excavations in the northern block uncovered four post stains which formed a square that was 3.3 m on a side suggesting the presence of a structure. The structure faced the beach with a serpentine midden composed of black soil and firecracked limestone surround the landward side. Inside the structure there was an upright limestone anvil and five round sand concretions. Other anvils and sand concretions have been identified across the site. These are interpreted as work stations at which Chama shell was being processed into shell beads. There is very little pottery in the site. What little there is appears to have come from two or three decorated pots and one griddle which were imported from the Greater Antilles. There is no plain pottery of the kind expected if ordinary meals were being prepared. Moreover, of the few animal bones have been preserved in the site over 70% are the ear bones (otoliths) of grunts. This trumpet shell trumpet can only be played if you place your fingers on the places worn smooth by the hands of the person who owned it. These findings are striking for two reasons. First, the high incidence of imported pottery and other exotic artifacts indicates that the site served a special function, and the lack of typical food-related remains suggests that the site was not a permanent habitation. With regard to the later possibility, Irv Quitmyer analyzed 22 clam shells from the northern block excavation which is radiocarbon dated to the 13th century A.D. His analysis revealed that all of these clams were collected during a single season. In sum, the 13th century occupation of the site may have been very short lived. The fact that more than 300 complete beads were thrown into a fire, and other exotic artifacts including a shell trumpet were abandoned indicates that activities at the site ceased abruptly and the site was abandoned. There is no evidence that anyone ever returned to the site. Based on radiocarbon dates, seasonal indicators, imported pottery, specialized function, and camp appearance, it was hypothesized that the site was visited during the dry season months of February and March by Tainos from the Greater Antilles who made shell beads and then returned with them to the Greater Antilles. This hypothesis was thrown into question with data collected in 1993. First, radiocarbon dates from deep deposits in another part of the site were a century older. Thus, the site was not the single short-term occupation it appeared to be. Barbara and Reed Toomey at GT-2. Second, a human tooth from the serpentine midden was subjected to trace-element analysis by Dr. Jim Burton. The results indicated that the person to whom the tooth belonged had lived in a carbonate environment (the Bahama archipelago) during the period of tooth formation. Here then was at least one individual who did not make the trip from Hispaniola. It would appear that Native Turks Islanders were making the beads and then exchanging them with Tainos in the Greater Antilles, but at this point it is not clear who traveled to whom. Left: Betsy Carlson and Barbara Toomey measure strata in a wall profile at GT-2 to interpret changes at the site through time. Right: This Palmetto ware and imported pottery (between fingers) was unearthed at a site on Salt Cay. Much has been learned about the people who inhabited the Turks and Caicos before the arrival of Columbus. The most interesting of the artifacts are displayed in an exhibit upstairs in the Turks and Caicos National Museum, Front Street, Grand Turk. With the Museum’s help a great deal of research has already been completed, but even more remains to be done. With the cooperation of the Government in requiring environmental impact statements prior to development, efforts by the National Trust to preserve the natural and cultural heritage of the islands, and the diligent work of the National Museum to recover, conserve, and interpret the past, the Turks and Caicos are today a model for other countries in the West Indies. This article was originally published under the title “History Begins on Grand Turk” in Times of the Islands: The International Magazine of the Turks and Caicos. It was published in the Summer 1995 issue and is reprinted here with their kind permission.